Howdy! How forgiving can a custom fitted harness be in terms of changes in body proportions? While looking at financial records, it's clear that often times Medieval nobility would commission several suites armor throughout their lifetime. However, I imagine much of this was more a result of stylistic upgrades and an abundance of money rather than changes in body type (although Henry VIII stands as an obvious exception). This question is pertinent to me as I will soon be commissioning a custom harness. I'm 25 and in the military, so I'm actually rather forced to stay in shape, however I'm wonder if a suit that I commission now will still be usable later in life. Will a suit that fits me now at 6'1" 200lbs still fit me if I eat too much pizza or eat too little pizza? Will I be limited in working out too much and adding too much muscle if I want my armor to fit? I would love to hear from anyone that has any thought or experience with this! Thanks! I can speak VERY directly to this, as being a disabled combat veteran and the medical conditions that have come in life (biggest being a failing thyroid and metabolic syndrome stemming from it) have directly forced changes in my body physique (that have taken literal years to get under control with medications, so it's been a hard ride . . . and still going). I know what it's like to be a fit soldier and then have life say, "HAH! You thought you were going to stay like that?!" Before finances became too extreme of an issue, I had 3 sets of armor: custom plate, full chain, and fantasy leather. For information's sake, I'll share experiences with all 3. The leather was quite forgiving, the strapping and harness easily adjusts and/or was replaced to accommodate changes. One of the only straps that doesn't quite fit well right now was because I had trimmed it a bit too much after the first replacement (whoops). As things have gotten under control and moved back in a healthier direction, it's been just as accommodating for the return ride. I'm glad I never parted with this armor; and I'd say that, unless you had something that was poorly sized and fitted in the first place, leather aspects shouldn't be much of a problem. My chain was the least forgiving of all. With a great deal of tailoring and adjustments in the riveted mail, it could have been made to fit. It wouldn't have been too difficult, but extremely tedious and somewhat costly on materials . . . especially with the complexity of refits in areas like shoulders. As finances became more of a concern, parting with the armor was easier and more financially feasible then keeping it around. Thankfully, the sleeves and chausses for my plate were already quite forgiving enough in size and never became an issue. Speaking of the plate, it's been reasonably forgiving. I've never had to stop wearing it and have never needed more than minor adjustments. Depending on what kind of harness you have, your mileage may vary. I have a kind of generic gothic kit, and not grounded in any specific historical look, as even at the best times I've never been able to afford much above munitions grade armor . . . custom tailored stainless steel . . . but still quite generic in the looks department. Except the helmet . . . that's a cheap but hefty sugar loaf helm because that's what I could afford and I knew it'd put up to a LOT of abuse (and I'll admit I like the look of sugar loaf helms over a bevor any day). My full greaves with pin closure were the least forgiving piece, and I had to change some arming garments and how I wear them to ensure they still fit right. However, the full sabatons never became an issue, as they were already tailored for wear over boots; and that never really changed. The breast and back plates never provided any issues, either. The finger gauntlets with cuffs that cover most of my forearm were never an issue. Of course leather buckles, ties, and strapping in the harness never had an issue and were easily adjusted whenever needed. Granted, I don't have a rerebrace or vambrace in my armor, but I'm going to say that they'd probably be more like the full greaves that I have; and if you've got "open" greaves, rerebraces, and vambraces then that should mostly just be a matter of strap adjustments and not a serious issue. A new strap with a quick rivet, or spare lacing, was never an issue in maintenance, anyway. Well, I hope that helps. I'll admit it's not exactly the most comfortable subject to talk about with the medical facets, but given the question and direct experience, I figured it'd be worth sharing the information. Maybe the experiences of others are different, but there are always going to be differences based on armor types, specific kits, and the factors that play into biological facets. I'm 25 and in the military, so I'm actually rather forced to stay in shape, however I'm wonder if a suit that I commission now will still be usable later in life. Well, Henry VIII was an interesting study of the potential (and likelihood) of change. I was in almost the same position (when in military training was 5'9 and 152 lbs), and unfortunately, decided to get a bunch of custom suits (as in what you wear to work, not armor) made bespoke. I have been out about 1 year 9 months, and decided to take a bit of time just to myself and relax, drinking beer eating pizza, etc.. and I went from a 29" waist to a 34" waist.. a 38 suit jacket to a 40.. I have been trying to get back to the gym. I have been trying to slim down again, but without that stick there is just very little motivation and I am 28. I don't feel like I will ever make it back. Anyway, none of the suits I bought have been salvageable so far.. I am just too fat (almost 180lbs now) to let them out. Which is about a $6k loss if I can't slim back down. Everyone warned me at the time, but I didn't listen. My custom tailored mail, and custom aketon, are also too tight.. but within range I think I will be able to fit them again after a bit of dieting. Anyway, just my thoughts! I loved the physicality of it, loved the gym my whole life, and never thought I would let myself go.. but, I did. EDIT: One other perspective, my older brother was National Guard, when he got out and got married, he went downhill fast. I think he eventually got up to almost 400lbs (380ish or so at least, he is 6'4"). When he hit 40 he got a vasectomy and his stomach stapled, and back to the weights. He is now back to his college/military physique.. so it is possible. Just depends on what you are like. Heh, well, I commissioned my cuirass that I still fight in at age 21. I’m about to turn 39. I’m proud that I’m still in great shape, but I can’t lie, I had to have “extensions” rivetted in the sides to accommodate that I’m not quite so skinny anymore. According to Scott Wilson, this was a period way to handle the exact problem, which makes sense, because I can’t be the first person to have had this problem. A simpler breastplate will not have this issue. Arms and legs typically have a lot of leeway in sizing that you can get away with changing your weight a little bit, unless if it is an extreme change. The same goes for your helmet, unless if your neck size drastically changes. The bottom line: custom armor is expensive, but if you keep in decent shape, you will get many happy years of fighting out of it with minimal modifications. 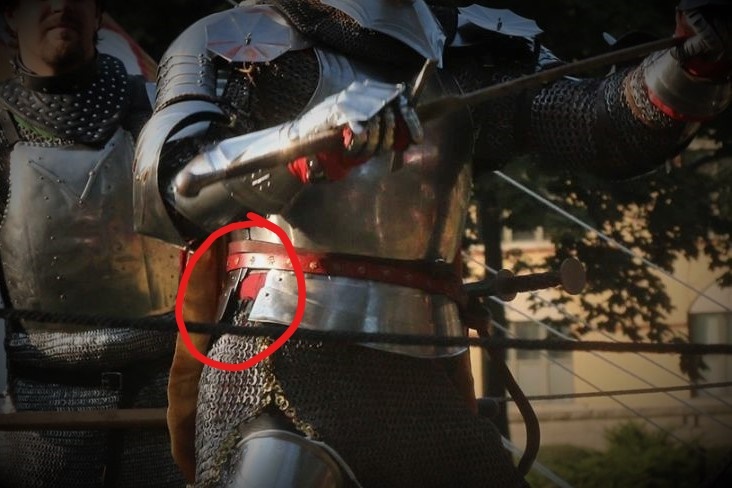 If you are concerned about it, though, look into armor that doesn’t completely enclose you, such as a breastplate instead of a fully enclosed cuirass. Well hopefully your joints are not going to move and you'll remain roughly the same shape, but you may well grow in places. Usually the waist expands but you might get all bulging biceps. Really i think that back then alot of smarter people got armour with a bit of give, a planed 2 inches of give around the waist and as a grown (and fattened) adult, not a 18 year old rake. I had to have “extensions” rivetted in the sides to accommodate that I’m not quite so skinny anymore. Happy According to Scott Wilson, this was a period way to handle the exact problem, which makes sense, because I can’t be the first person to have had this problem. I can see how a coat of plates might be expanded, the same with a Churburg type 13 breastplate. Thanks guys for great responses. And thanks Ben for the specifics on different pices of armor! Like many of you pointed out, I probably will get bigger in my 30s and 40s, either through the gym or through taco bell. In body type I take after my father and all the men on his side, and they all had about the same dimensions as me at my age, and then capped out at about 220-30lbs in their 30s and 40s. I expect the same to happen to me, especially once I am out of the military and will be able to workout how I want to. I see a common theme is to get armor that can be adjusted. However, I want to represent an early 15th century English man-at-arms. I really do like the aesthetics and purpose of fully enclosing legs and arms, and a breastplate and backplate. I assume this armor scheme is the easiest to adjust? Also, I'll most likely be commissioning the armor from Poland, so it would be a hassle to ship armor back and forth for refitting. Does anyone have any experience with getting their armor recfitted? How difficult is it, how far can you go until your need a new piece all together? Historically and today, the other solution was to sell the old armour and buy a new one. Good armour usually holds its value as long as you maintain it, cheap armour not so much. A full armour was capital, so if it was no longer earning money (or they needed quick cash), most people sold it or pawned it. Every army, fair, and large town in 15th century Europe had people who bought and sold used armour, and there are letters and memoirs which show soldiers were buying and selling decorated weapons and expensive horses in the classical world. I would focus on the things I can control, like getting an arming doublet with a visible waist which is not too thick or baggy and building exercise and healthy eating into my life. Actually, mine is a fully enclosed 15th century breastplate. The extensions are rivetted to the sides of the backplate so that the breastplate overlaps them. It's a fairly simple solution, and any decent armorer should be able to do it. I don't have a great picture, but you can somewhat see it in the attached image. It is above the gap where you can see my red arming doublet underneath. The only gap is where the fauld is, and it isn't that noticeable unless I'm actually pointing it out, as I am here. EDITED TO ADD: The gap that you see is normally covered by my mail skirt, but one of my points had broken and it slid down. When it's up at my waist where it is supposed to be, that gap doesn't show any fabric underneath. Adding to this, if your arming doublet laces rather than buttons, it's fairly easy to adjust if you gain a few inches at the waist. Most men expand from front to back with weight gain long before they start going sideways. It is usual to see at least two adjustment holes for cuirasses with turning/spring pin closures. In our time and place, one can control weight quite a bit by food choices, veering away from simple carbs and eating more of other things (not saying to cut the carbs altogether), but I admit I would like to eat big, fluffy, buttermilk biscuits far more often than I do. Anyway, by having lots of overlap between breast and back, you can keep wearing it a lot longer and getting back down to being able to fit into it if you balloon up will be easier. As far as bulking up muscle wise, this is my take. I gave up on that when I found that being huge is about muscle scarring (women are not as prone to this, so they find it much more difficult to bulk up without steroids), not efficient muscle, I was off that track. The warriors of the 15th century were shaped more like male ballet dancers than Aaahnold, very toned, not bulky. Women tend to like toned over bulky, anyway. See my avatar photo? I still fit into that cuirass twenty years after I made it.